This is the second part in a two-part series. In the first, I discussed how I came to my atheism, and in this post, I will attempt to give the reader my reasoning behind that conclusion. Author Sam Harris has suggested that the title “atheist” is perhaps counterproductive. He very well may be right. He went on to claim that, “The rejection of absurdity is more important than atheism.” With this latter statement, I wholeheartedly agree. I’m not an atheist because I want to be, I’m an atheist because I find science and reason–not faith and tradition–to be the best method for learning about the universe that surrounds us. We have progressed to a point in our civilization where we know certain facts to be true, and we cannot continue to ignore such facts because it is inconvenient or contradictory to age-old beliefs. 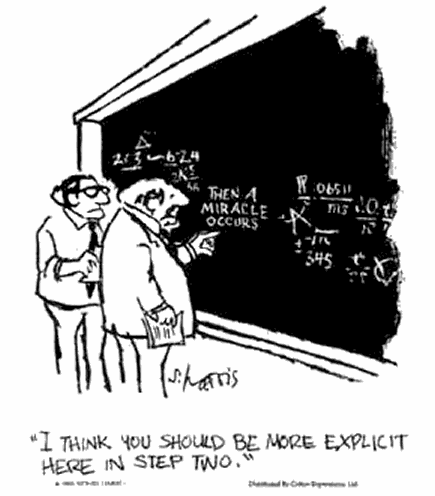 In past discussions I’ve had with creationists, I’ve tried to explain how it isn’t merely enough to try to knock down a theory, but there needs to be an alternative viable explanation of the observed phenomena. I will attempt to live by my own words here, and do the same to religion. I will provide arguments against our common notions of a god, and provide reasons why science is a better system for understanding the universe around us. As I said in my previous post, I’m still technically agnostic about the idea of a god. That said, I am 100% atheist about the idea of a god of man. The idea that a god comes down from the heavens to intervene is absurd. First, let’s take a look at the “supernatural” aspect of God. The word supernatural means “beyond nature.” If it is a part of the physical world and is an observable phenomenon, then the mechanics should be able to be tested and understood by science. This would render the supernatural to be just plain natural again. To be of the universe, there must be evidence of existence. If God existed in another plane of existence, and thus had no effect on this universe, then he must not be omnipotent. So if there is a god and he acts upon the universe, there must be evidence. This brings me to my next question: What god? There have been thousands upon thousands of religions, some predating recorded history. Even today one has countless religions from which to choose, and if none of those religions fit, the creative prophets among us can just start their own. The Mormon faith is less than 200 years old and was founded by a convicted con artist, Joseph Smith. The story of his revelations are demonstrably false, and yet it has grown at an incredible pace. That said, I find it incredibly hypocritical that we point to newer religions like the Mormons and Scientologists and say, “Oh, those guys are nuts!” Faith is, by definition, the willful suspension of disbelief. We accept virgin births, men living in whales, and great floods in our own faith, despite the fact that science has roundly rejected all of these miracles as impossible. When looked at from a purely scientific point-of-view, all religions become implausible. Where are all the modern miracles? Where are the modern prophets? The god we pray to is largely the result of a combination of parenting and place of birth. How can a god condemn billions of souls to hell for simply being born in the wrong time and/or place? All of this suggest to me that we are not dealing with a god that made man. Instead, I believe we are dealing with men who made many gods. Perhaps there is a deity, a “prime mover” if you will. If one does exist, there is no evidence that he intercedes into matters on Earth or elsewhere. Theists will often point to the mere act of existence as a miracle and all the proof that they need for a creator. I am no less amazed by our existence and the beauty of the cosmos (in fact, I’m probably more amazed). But the more I learn about the universe, the less God makes sense. Let’s start from the beginning. 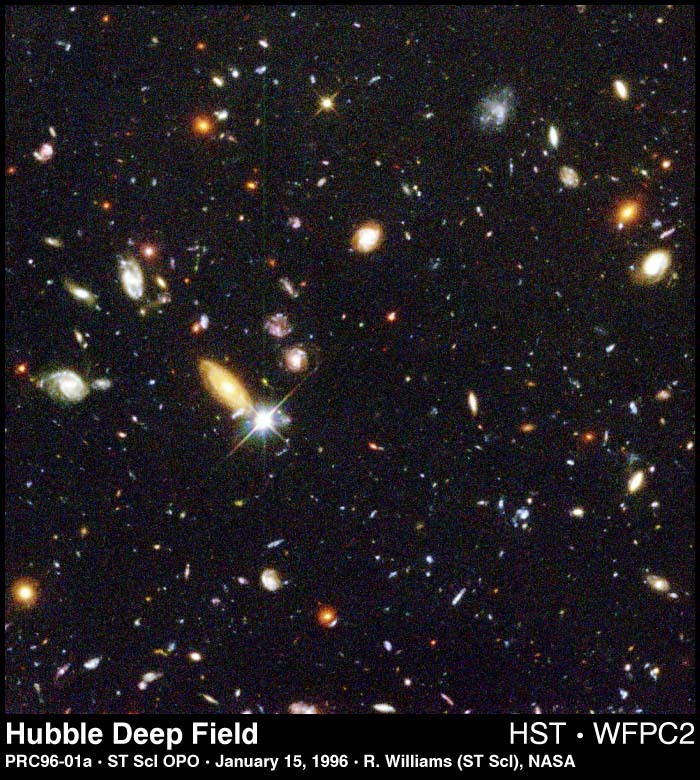 Our observable universe dates back to about 13.7 billion years ago. This fact alone is enough to disprove the entire biblical creation story. It also means that in order to create man, the universe had to be created, cool down enough to form basic elements (hydrogen and helium), form massive stars which would produce heavier elements up through iron, which in turn would form the rest of the heavy elements through uranium when they went supernova. These stars would clump together to form galaxies, and these galaxies would clump together to form groups, clusters, and super clusters. Our own Milky Way galaxy has over 200 billion stars, and there are an estimated 170 billion galaxies in the observable universe. It is easy to look at the diversity of life on Earth and think that our planet was perfectly made. It has a stable, nearly circular orbit around a stable star in a zone that allows for liquid water on the surface of the planet. Also, we’re a large enough planet to maintain internal heat and an active core, which recycles materials through plate tectonics and the resulting magnetic field helps to protect life and the atmosphere. We also have a moon that helps to stabilize our tilt, which is the reason we have seasons. However, this is not the end of the story. Our planet has been through significant turmoil throughout its 4.6 billion year history. The moon only formed after a mars-sized object rocked the Earth. We have been completely molten, and completely frozen over. There have been other significant impacts and enormous volcanic eruptions, some of which led to the aforementioned mass extinction events. As amazing as the Earth is at supporting life, it’s nearly as good at wiping it out, as 99.98% of all species ever to have lived are now extinct. Humans came extremely close to joining that 99.98% when one super-volcanic eruption about 70,000 years ago in Indonesia reduced our population down to a mere few thousand. Our Earth is constantly changing, we’re lucky to have made it this far, but we’ve only been residents of this planet for the tiniest fraction of its history. Even if the Earth does occasionally try to kill us all, it is much more welcoming than what is “out there.” No other planet or moon, in this solar system or those so far discovered, harbor life that we know of. By in large, our universe is a vast wasteland of nothingness. The scale of our own solar system is nearly beyond our comprehension. That’s just the planets (plus Pluto) of our solar system. The actual solar system stretches much further than that, but it’s nothing compared to the distances of interstellar space. The universe is unimaginably large. It was important to early astronomers to make the Earth the center of a small universe, and I understand why. If we were not the center of God’s creation, then what was our relationship to God? Unfortunately for them, every scientific discovery has moved the Earth further and further from the center. And each discovery has made the universe exponentially larger. First, the Earth was discovered to be revolving around the sun, and was merely one of 5 (at the time) other planets. Then, we discovered that we were part of this giant galaxy, containing hundreds of billions of stars other than our own. Finally, we discovered that we are a just a single galaxy among hundreds of billions, and that we are racing away from each other at unfathomable speeds. Indeed, what is our relationship to God, if he exists? Why did he need so much space and time for a single creation that took billions of years to evolve? Perhaps I’m beating this horse to death, but I feel I’d be remiss if I did not mention human evolution as evidence for unintelligent “design.” The cost of walking upright has been endemic back pain among adults, and painful, potentially deadly, childbirth. Our large brain has led to tooth problems (which if go untreated are potentially fatal). We eat, drink, and breathe through the same hole, thus endangering every human of choking to death during any given meal. While creationists point to the eye as proof of a god, they cannot answer why birds and octopuses have better vision than we do, and why our eyes are upside-down and backward and have a blind-spot. 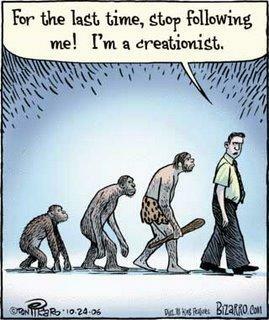 Evolution, on the other hand, explains everything beautifully. In some sense, I sympathize with Christian young-Earth creationists who come down against the theory of evolution in all forms, because they realize that either the Bible is correct or scientific theory is correct. They see that if one part of the Bible is proven to be incorrect, the rest of it comes down like a house of cards. Without Adam and Eve, there can be no original sin. Without original sin, there is no need for a messiah. Without a messiah, there is no need for Jesus. Ironically, many moderate Christians and intelligent design creationists have had to evolve to fit their faith into the gaps of knowledge of current scientific understanding. Instead of flat-out rejecting evolution, they try to mold it to fit their worldview, so we hear phrases such as “Micro-evolution” and “Macro-evolution.” Of course, no such distinction exists. I think this is the issue that I find most upsetting about faith–the willful ignorance on a subject, just because it doesn’t fit in with preconceived notions of how the world should be. And when I say “faith,” this is not a wholesale attack on religion, but it can just as easily be applied to political matters. In order to continue to survive as a species, we can no longer afford to brush aside fact in deference to faith. There are certain facts that we know to be true, but it is still socially acceptable to reject those facts on the basis of faith. This particular social nicety must end. We don’t know everything, but no scientist is claiming that. However, there are things that we do know. My favorite example is the one of global warming. We know the Earth is warming due to human activity, and we know that the implications of continuing inaction could be catastrophic. This shouldn’t be a political matter, as it will affect us all equally. This is a case where the science is conclusive, and the overwhelming majority of climatologists have come down on one side of the issue. Yet faith is still prevailing. Global warming skeptics, along with creationists, look for gaps in otherwise solid data to “prove” their claims. Were global warming not being caused by humans, we would need more than just a few anomalies and unexplained holes in our understanding of the global climate; we would need a whole new theory which would encompass all of the current observations. We could be dead wrong about global warming, but even if it were proven that man is not responsible, we would need to find out the reason for why the Earth appears to be heating in direct correlation to the the rise in carbon dioxide levels in the atmosphere (among many other observations). Of course, science is open to such new theories. There is no agenda to keep out new ideas–quite the contrary. However, these new ideas must add to our knowledge. Simply saying, “We don’t know, so it must be God,” is not acceptable in science. Arguments for the existence of God within our current framework of knowledge are perfectly justified in philosophical or theological debates, but without empirical data to back up said arguments, they do long belong in scientific circles. One glaring omission from these series of musings has been the question of our mortality. Trust me, no one is more attached to me than I am to myself. I would like to believe that I could survive death in some form, but this is merely wishful thinking on my part. Is it possible? Certainly the stories of those who have experienced near-death experiences are compelling, but those exact experiences can be recreated in a lab, so it remains an unknown. So what if this is the only life we have? Some might say that I have more to fear than my religiously inclined brethren, but instead, I think it gives me more reason to “get it right” the first (and only) time. In studies, when you ask a religious person why they believe, they will say it is because of the order of the universe. When you ask that same religious person why they think other believers believe, they say it is due to fear of death or the need to be comforted by a higher power. I find this fascinating. Humans are highly adept at holding two conflicting ideas in their head at the same time, especially when it comes to justifying their own beliefs. It highlights how we can notice wishful thinking in others, but not ourselves. Also, it shows what power the fear of death holds over us all. It is inevitable for all of us, but we’ll set aside all rational arguments in the hopes of somehow avoiding death. Perhaps it is the lack of wishful thinking that theists find the most appalling about atheists. It seems like a dark, gloomy place, where every ending is an unhappy one. This is simply not the case. I am amazed by the world around me, and the ability to enjoy it, if only for the briefest of moments.